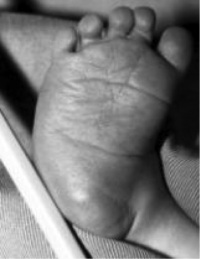 Scoring the foot at each visit during treatment enables the physiotherapist or health care worker treating the child to document how the foot is responding to the manipulation and casting. It also assists in determining when to perform the Achilles Tenotomy. Consider the following examples which highlight different elements of the Pirani Score Process. What is the Total Midfoot Score? What is the Total Hindfoot Score? What is the Total Pirani Score? Is this patient ready to undergo Tenotomy? 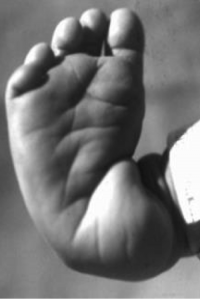 ↑ 1.0 1.1 1.2 1.3 1.4 1.5 Africa Clubfoot Training Project. 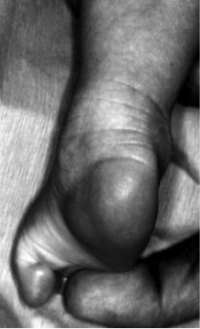 Chapter 4 How To Assess the Severity of a Clubfoot using the Pirani Score. Africa Clubfoot Training Basic & Advanced Clubfoot Treatment Provider Courses - Participant Manual. University of Oxford: Africa Clubfoot Training Project, 2017.